COLUMBIA, Mo 3/25/18 (Beat Byte) -- Second Ward Columbia City Councilman Michael Trapp may be guilty of another conflict of interest. Just months after voting to give $748,000 in taxpayer funds to Welcome Home, Inc., a Veterans homeless assistance service, Mr. Trapp (left) signed a consulting contract with the firm. A different contract he has with the downtown CID and his previous employment with Phoenix House raised similar conflict-of-interest concerns. With Mr. Trapp's "yes" vote in 2016, the City Council gave Welcome Home, Inc. $248,000 in Federal Community Development Block Grant (CDBG) funds and $500,000 from the city's General Fund, used to finance police, fire, health department and other basic services. "I have abstained from voting on issues of which Welcome Home is a party since I contracted with them," Mr. Trapp told the Heart Beat. "My contract is for a modest amount for highly specialized work of which I have clear expertise." Dated Feb. 2016, Council Bill R12-16, "authorized agreements with Welcome Home, Inc. for the use of CDBG funds and City of Columbia FY 2014 General Fund savings for the construction of a homeless veterans emergency housing and supportive services facility." "VOTING YES: TRAPP, SKALA, NAUSER, PETERS, MCDAVID, RUFFIN. ABSENT: THOMAS," minutes from the Feb 1, 2016 meeting explain. A Council memo attached to the 2016 legislation provides ongoing taxpayer financing for the non-profit: “Approval of this resolution will authorize CDBG and City Surplus funding agreements for the Welcome Home Veterans Campus project." Welcome Home will receive another $17,800 in taxpayer funding for fiscal year 2018, according to an Aug. 2017 funding request list. The Councilman has provided contract consulting services with Welcome Home since at least September 2016. He and brother John Trapp formed their consulting firm, AAAChange, LLC, in May 2016. "I was asked to contract [with Welcome Home] by the previous executive director immediately after I left Phoenix House, " he said. Mr. Trapp made his fellow Council members aware of the conflict last year. “Upon his request, Mayor Treece made a motion to allow Mr. Trapp to abstain from voting on B150-17," the Columbia City Council's June 19, 2017 minutes explain. "Mr. Trapp noted on the Disclosure of Interest form that his limited liability company contracted with Welcome Home on quality improvement activities." 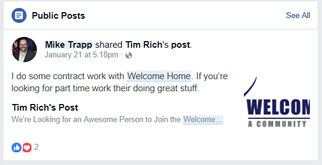 "My long experience with helping struggling people has served me well as a policy maker," Trapp explained on his government Facebook page, where he often advertises for Welcome Home. "Columbia is a small town when it comes to social services." Mr. Trapp faces challenger Paul Love in the April election. You are here: Home City Hall City Council UNWELCOME: Did YES vote on $748,000 taxpayer funding land CoMo Councilman consulting contract? TRAPP-ED: Did Second Ward Councilman's conflict of interest lead him to support Blight?